About new goals for the upcoming season and work on the new programs in the interview with Tiffany Zahorski and her partner Jonathan Guerreiro. Tiffany, can you describe your first feelings when you received Russian passport? Tiffany: At that moment I was very happy, because I realized that now we are really in the national team, I’m Russian and we can compete without waiting for someone else’s permission. 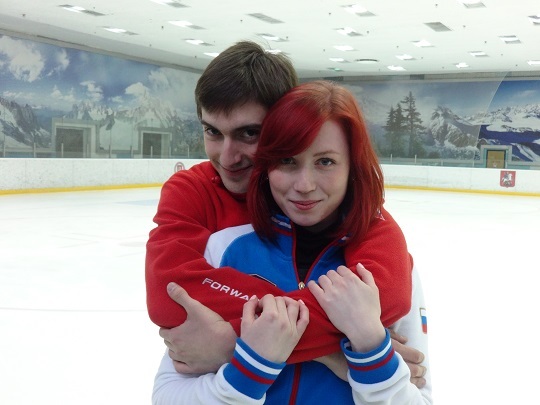 Last season, I had only the release from French Figure Skating Federation that gave me the right to skate for Russia, but the lack of a Russian passport limited us in some actions. Jonathan: Without a passport, we felt as subpair. It seemed we have a permission but Tiffany hadn’t passport and it created obstacles in becoming a part of the Russian team, limited other “movements” since this document is needed everywhere. But since February our worries have been settled because we were informed that the issue was practically solved. We just needed to be patient and wait. We were aware how the process is progressing. However, when Tiffany got a passport it was really cool! So many efforts, so many nerves it took to get the opportunity to compete and to continue our sporting career! How has your attitude to work, your motivation changed because now you can set the most serious goals? Jonathan: Now we have to catch up a lot in terms of participation in international competitions. Last season we were able to go to only to one foreign competitions, now we set the goal to start the season as early as possible on “Challenger” and pre-season competitions, but it’ll depend on funding. If all goes well, it would be great to take part in a home Grand Prix. Tiffany: I’d like it so much. It’d be not only a great experience, but also a great honor for me. How do you think what is the hallmark of your pair? Jonathan: I think our coach Alexander Zhulin told a right thing about us. In his opinion, there’s a certain proportion of self-irony in our attitude towards life and figure skating. It’s not “indifference“, that we don’t care no matter what happens. It’s rather a developed protective reaction. From the moment we’ve started to skate together we have gone through so many difficulties, had so many obstacles to overcome. It has taught us to wait and endure. That’s why every start is a buzz for us. Many skaters after performance are giving standard comments that they skated for pleasure, for each other, that public helped them … For someone it’s just words. But for us it’s reality. You know, when you have been trying to achive something for a long time, and then later you eventually achive it, you start to appreciate it in a special way. We have been waiting for this opportunity to become a member of our team for so long, that now it would be foolish and wrong not to enjoy this moment on maximum. Jonathan: Each performance for us – it’s like a reward. Of course, this season, the tasks will be more serious. Perhaps it’ll add worries and responsibility. But I hope that our attitude will help us. We really want to show ourselves on maximum. Programs are ready, so we have to work on. Can you tell us about the new programs? Jonathan: We won’t disclose all the secrets but we actually have done a huge work. Alexander Zhulin has thought a lot about programs. We have tried different options, however the initial idea our coach came up with during his creative search, was the correct one. We’ve started the work in March. But we weren’t in a hurry with a program. Much has been changed in the process, ensuring that every step, every element is comfortable. Turned out so that in that period Zhulin was working almost exclusively with our pair. Every day we spent 6 hours on the ice, in addition to other training in the gym. A lot of time was given to the choreography, working with Sergei Petukhov. Tiffany: However, suddenly appeared a problem with my knee – old injury. One day, came from the ice and I felt a lot of pain. I had to miss a month. Went to the physio therapy, was treated. Doctors said that yet the surgery can be avoided. It is necessary to strengthen the muscles. Now everything is fine. Jonathan: Back in March we chose the music for the short dance performed by Christina Aguilera. Tiffany found this blues and I liked it immediately. The melody is very catchy. When we turn it on, everyone on the ice start to dance. Then for a long time we were looking what to add to the blues. We stopped on the swing, so it can be combined together well. Plus, we thought that most dancers will be doing hip-hop this season. Tiffany: And we want our dance to stand out. Jonathan: Alexander Zhulin suggested the idea of the free dance. Honestly, at first we did not quite get it. There were doubts whether it’ll suit our pair, but we liked it. Those who have seen the scetches of our free program, said that if everything worked out, the dance will be very interesting to watch. Intriguing. Have you already rested before the season or you choose to work non-stop? Tiffany: I went home. Since I spend a lot of time in Moscow I rarely see my mother, miss her. I invited John to France, but he had other plans. Jonathan: I have spent childhood in Australia, and since have been very fond of the ocean. It’s won’t be a vacation for me if I don’t see the sea. Hubbell / Donohue and Fernandez announced the music.